Binary options, contracts for differences, spread betting and other speculative activities related to financial instruments, currencies, securities and the like, are not considered a form of gambling under Israeli law. These activities are regulated under Securities Law 5728-1968. The Tel Aviv District Court ruled in 2016 that trading in binary options does not constitute a form of prohibited gambling.5 However, the Israeli Securities Authority (the Authority) has prohibited Israeli licensed trading platforms to offer binary options to Israeli retail customers.6 Furthermore, despite the aforementioned judicial finding, explanatory notes accompanying a draft bill circulated by the Authority, seeking to further restrict the involvement of Israelis in binary options trading, make reference to the Authority’s position regarding the ‘gambling-like’ characteristics of binary options trading. Reports have suggested that various Israeli governments have considered a limited liberalisation of the blanket ban on bricks-and-mortar gambling, by allowing the construction of a small number of casino resorts in Eilat, a resort destination on the Red Sea. However, in the face of widespread criticism, no such initiatives have progressed. In 2017, the Israeli Minister of Finance revoked the permit granted to the National Lottery to operate a limited number of video lottery terminals (VLTs). This revocation has been judicially challenged by Lottery concessionaires and as of May 2017 the matter remains pending before the High Court of Justice.7 Statements made by the Ministry of Finance suggest that the Ministry further wishes to revoke the permission granted to the Israel Sports Betting Board to conduct horse race wagering. b The Israel Sports Betting Board (ISBB) was established in 1967 under the Law for the Regularisation of Sports Betting 5727-1967. The ISBB has the exclusive right to organise and regulate sports betting in Israel. It offers betting on football and basketball games, as well as a limited horse race wagering service. With respect to online gambling, Israeli courts have ruled that Israeli law applies to online gambling conducted by foreign operators, when it is made available to Israeli players. 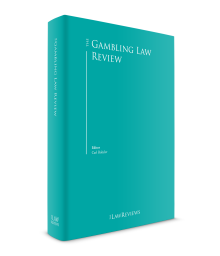 In other words, when a party to the gambling transaction is located in Israel, the entire activity would be viewed as a violation of the prohibition on gambling. Enforcement has focused on operators specifically targeting the Israeli market (i.e., advertising to Israelis, using the Hebrew language, etc. ).8 To date, Israeli authorities have never taken enforcement action against foreign operators with no presence in Israel, and that have not specifically targeted the Israeli market. Prizes in excess of 50,000 shekels are subject to withholding tax at source. Tax rates are incremental for prizes between 50,000 shekels and 100,000 shekels and are set at 30 per cent for prizes above 100,000 shekels. The most significant development over the past year has been the decision by the Ministry of Finance to revoke the permit previously granted to the National Lottery to operate a limited number of VLTs. The revocation occurred as part of the renewal of the National Lottery’s licence. The Ministry’s decision to revoke the permit was strongly opposed by Lottery concessionaires as well as by local government (which is a major recipient of Lottery revenue). The decision to revoke the permit has been judicially challenged and the matter remains pending before the High Court of Justice (as of May 2017). In addition, the Ministry of Finance has announced that it intends to further restrict the availability of gambling in Israel by disallowing the offering of horse race wagering by the ISBB. As noted, Israel is notoriously conservative with respect to gambling. It is unlikely that the coming year will, therefore, bring any liberalisation to the market. In fact, it is more likely that the coming year will see the introduction of bills intended to further restrict the availability and proliferation of online gaming (e.g., through ISP blocking measures) and additional restrictions on the activities of the National Lottery and ISBB.